Any mum can confirm that raising kids can – at times – be enough to make you want to tear your hair out, but the memories provided along the way more than make up for the tantrums and stress. 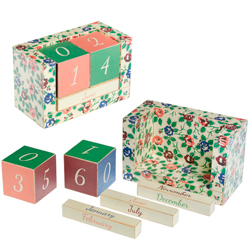 Why not let your mum save your precious moments for posterity with this cute scrap-book set? Away from the basics of raising a child in ensuring they are fed, kept safe and loved, every parent has their own unique ways of going above and beyond to nurture their youngsters. 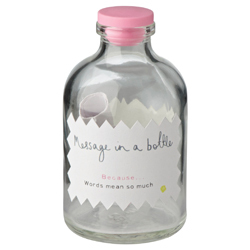 This bottle contains two scrolls on which you can provide a personalised thanks for your mum’s efforts. 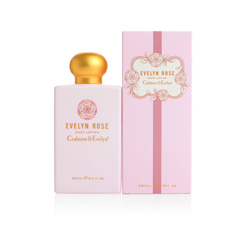 If you want your mum to pamper herself, why not treat her to the hydrating benefits and ultra-feminine fragrance of Crabtree & Evelyn’s Evelyn Rose Body Lotion? Conditioning rose extracts, shea butter, and a blend of moisturising oils will help leave her skin noticeably soft and smooth to the touch. This chunky bracelet features a quirky-yet-feminine design sure to bring a smile to the faces of mothers of all ages. 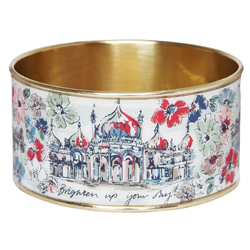 Perfect for adding the finishing touches to outfits for a range of occasions, Cath Kidston’s fun piece of jewellery comes highly recommended. While calendars might make great Christmas presents, they suffer from the basic flaw of literally becoming out-of-date after one year. Coming to the rescue is this neat desk calendar which mums can update to their heart’s content. It looks very pretty too!